In this tutorial, we will learn about different ways of checking subset relationship in a given pair of sets. This method takes iterable (list, tuple, dictionary, set and string) as an argument, if iterable other than set is passed, it first converts the iterable object to set object and then checks whether all elements of a set ( on which issubset method is invoked ) are also present in a set ( passed as an argument ). If yes then it will return True otherwise it will return False. This operator is used check whether a given pair of sets are in a subset relationship or not just like issubset() method. The difference between <= operator and issubset() method is that, the former can work only with set objects while latter can work with any iterable. 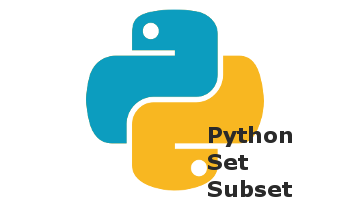 That’s all for Python Set Subset with Example. If you liked it, please share your thoughts in comments section and share it with others too.